The members of the Curé D'Ars Prayer Group pray daily for our local bishop, parish priests, seminarians, and for more vocations in the Diocese of Raleigh, North Carolina, USA. Click here to view the prayers that each member is required to say every day or download a pamphlet of the prayers in PDF format. You may also download a bookmark version of the prayers in PDF format. To join the prayer group enroll here. Please visit the Curé d'Ars Blog. The Priest. Honor the priest. Who received your soul as it entered on its spiritual life by baptism? The priest. Who nourished it and gave it strength on its pilgrimage? The priest. Who will prepare it to go before God? The priest - always the priest. And if the soul should die by sin, who will call it back to life and give it rest and peace? Again, the priest. Can you remember a single gift of God without seeing by its side a priest? Of what use would a house of gold be if you had no one to open the door for you? The priest has the key to the treasures of Heaven. He opens the door; he distributes the gifts of God. If you went to confession to the Blessed Virgin or to an angel, could they absolve you? No. Could they give you the Body and Blood of Jesus? No. The Blessed Virgin could not call her Divine Son down into the Host and were a thousand angels to exert their power they could not absolve you from one venial sin. But a priest, no matter how humble he be, can do these. He can say to you, "Go, your sins are forgiven you". (09-May-2018) Father Stephen Smith Memorial Mass - Wednesday evening, May 09, 2018 at 6:30 PM at St. Michael's in Cary. (04-August-2015) Prayer to Prayer to St. Joseph for Persecuted Priests. 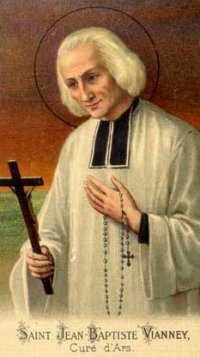 (04-August-2015) Prayer for a Pastor and his Parish to Saint John Vianney. For questions or comments about this site please email the Curé d'Ars Prayer Group webmaster. Download the Curé D'Ars Prayer Group Poster for your parish bulletin board.